Cover Photo: Photo: UK006 Clive Guillam Molyneux. Clive’s parents are Walter Guillam Molyneux b. 1922 in Pemberton, Nr. Wigan, Died 1997, and Mabel Kathleen Hayden b. 1924. They married in 1949 at Enfield, Middlesex. Clive’s Mx ancestors all came from Wigan, Lancashire, England. 8) Angela Sendlebach looking for photo of parents of Johnny and Ora Mullinax parents. 9) G.S.Molyneux – Fig Tree Fort nr. Bulawayo, also Molyneux Mines in S. Africa. News from UK: A Visit to Giant’s Causeway, N. Ireland IRE130 Tom Mx. 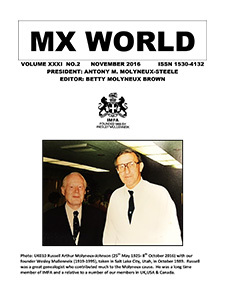 Front Cover: UK010 Russell Arthur Molyneux-Johnson (25th May 1925-8th October 2016) with our founder Wesley Mullenneix (1919-1995). Taken in Salt Lake City, Utah October 1989. He was a long time member of IMFA & related to a number of our members in the UK, USA and Canada. 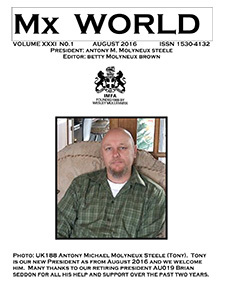 Cover: Photo: UK188 Anthony Michael Molyneux Steele (Tony). Tony is our new President as from August 2016. Blending lineages, family photos, stories and data extracts Betty creates a most enjoyable family history magazine for our very diverse, world-wide membership. 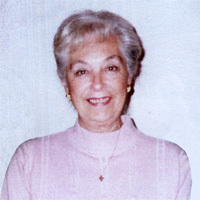 After Wes' death in January of 1995, President Betty Molyneux Brown in the UK stepped down, and immediately stepped up into the role as IMFA’s Editor. 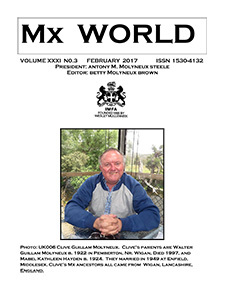 The newsletter was renamed MxWorld with a new masthead created by UK015 David Molyneux, and soon grew to 28 pages. Please send us your family stories and photographs, because members do like to read about other Molyneux families. Copyright © 2019 International Molyneux Family Association. All rights reserved. Genealogists and family historians may use the information provided here freely. This page, and the information it provides, may not be copied for commercial use of any kind. While effort has been made, and continues to be made for accuracy, information found herein should be verified against available records.